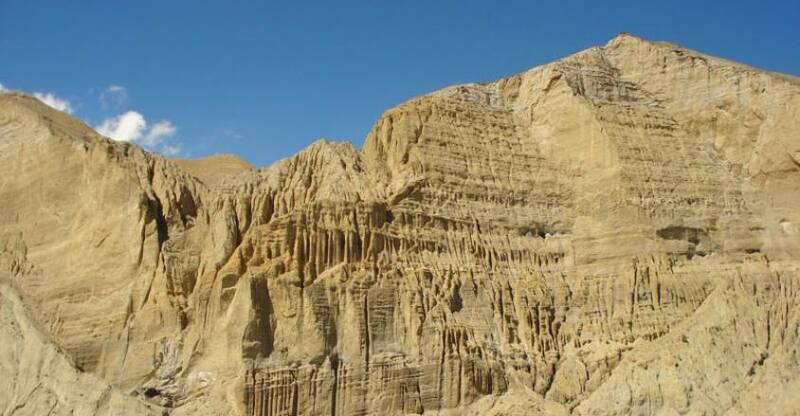 Upper Mustang Trekking is a rare privilege. Here you will experience the way of life of true mountain people, who were not much in touch with the rest of Nepal for hundreds of years, and even until recent times had an officially recognized king. In many ways, a trek into Upper Mustang is similar to trekking in Tibet, as geographically it is a part of the Tibetan plateau. The district of Mustang was, until 1950, a separate kingdom within the boundaries of Nepal. The last king, the Raja of Mustang, still has his home in the ancient capital known as Lo Manthang. Mustang's last official king Jigme Dorje Palbar Bista's palace in Lo Manthan, Upper Mustang. Upper Mustang Trekking has opened to non-Nepali trekkers only some fifteen years ago and even today, access is still highly restricted. 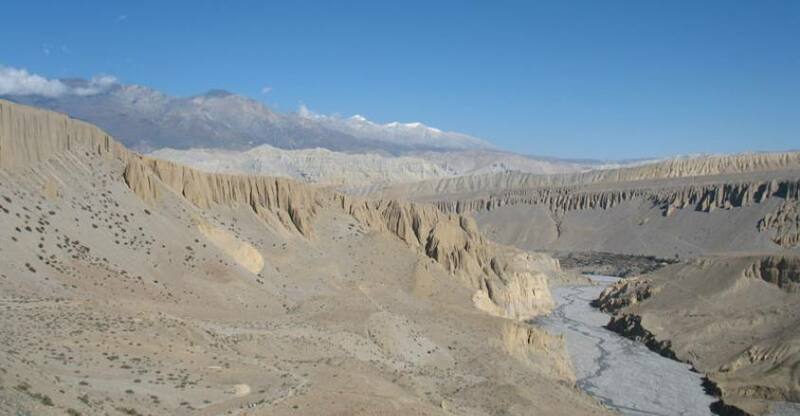 To enter Upper Mustang, that is to travel further north from Kagbeni, trekkers need special trekking permit and must be accompanied by a government register trekking agency. Upper Mustang, being in the Himalayan rain shadow, is one of the regions in the country suitable for trekking even during monsoons. During this time, the upper Kali Gandaki valley is still quite dry with only occasional rainfall. The banks of the Kali Gandaki River in Upper Mustang. 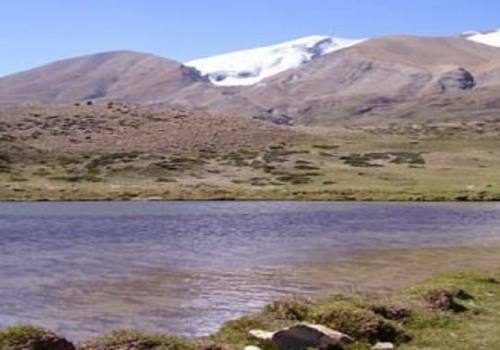 The Mustang trek is not particularly difficult, the highest point reached is only 3,800 meters, but the conditions at times can be arduous. Mustang is cold in winter and is always windy and dusty through the year. Winter treks are best avoided due to harsh weather. There are few accommodation facilities available above Kagbeni, so groups must be fully self-sufficient, especially in fuel. it is preferable to use mules to carry the loads up to Mustang. These pack animals are available locally and are more economical, and certainly more environmentally friendly than porters. all necessary things arrange by Halesi Treks Pvt.Ltd. 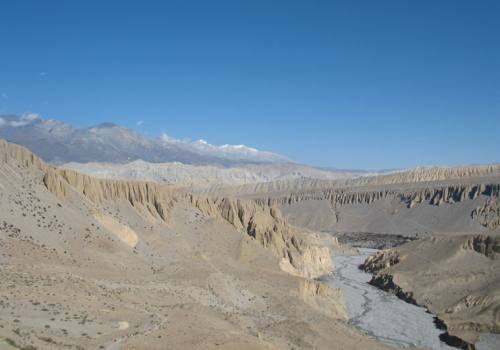 The rugged desert terrain of Upper Mustang is complemented by splashes of green vegetation for agriculture and pastures. 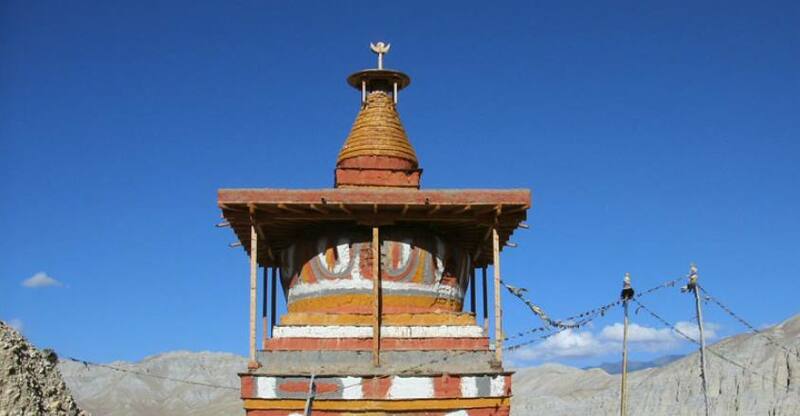 Mustang trek requires a minimum of 10 days, starting and ending in Kagbeni. This allows the trek to be completed within the 10-day period that the permit allows. The route generally follows the Kali Gandaki valley but, occasionally climbs high above the valley walls. The settlements are scattered and there is little sign of cultivation between villages. In Mustang, little grows without irrigation, thus the region resembles a desert albeit mountainous, nuclear settlements in fertile areas. A trekker to Mustang gestures his experience amidst the backdrop of Himalayan peaks.